I have been a quarter of a century and more a pro-Teuton. I owed too much to their music and their philosophers and authors of former times to believe it possible that the nation at large could be imbued with the teaching of a few advocates of mere brutal violence and material aggression. Even as he spoke, many of his most brilliant students were leaving to serve with the British Army, and Parry was all too aware that prodigious talent would be wasted on the battlefields of northern France: E J Moeran, Arthur Benjamin, Ivor Gurney, George Butterworth, R O Morris, George Dyson, Arthur Bliss and Ralph Vaughan Williams were among those who joined up. By April 1915, Parry was so upset about news of deaths that he almost broke down as he once again addressed the RCM students. Parry, who like many other composers of the period had taken leave of religion, found inspiration in the words of the King James Bible and in 17th-century English literature, both of which he drew upon for his motets. The first of the set, My soul, there is a country, is a setting of words by the Welsh metaphysical poet Henry Vaughan. 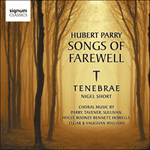 Before Parry completed the set he began to feel that the Songs of Farewell would literally be his goodbye to the world, or, in the words of his pupil Herbert Howells, ‘a magnificent codicil … his spiritually unorthodox farewell to a world in turmoil and distress’. When the set was eventually performed it was at a memorial concert for the composer in Oxford in 1919. And O my soul awake! All skillful in the wars. Probably the best-known of the motets is the first, ‘My soul, there is a country far beyond the stars’, a four-voice setting of words by the seventeenth-century metaphysical poet Henry Vaughan (1622–1695). The constant changes of rhythm and tempo make this beautiful piece quite a challenge; the rising phrases with which the work opens return at the end with a new strength and confidence. Hubert Parry’s My soul, there is a country examines the situation of the individual believer approaching the conclusion of life’s journey. 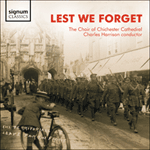 One of six motets collectively entitled “Songs of Farewell”, Parry completed My soul as his health declined, and the outbreak of World War One was causing his mood to darken. In these gloomy circumstances it is the steadfast optimism of Parry’s setting of lines by the seventeenth century poet Henry Vaughan which is most striking. Here is no fearfulness, or supine capitulation: God is “thy life, thy cure”, the poet says, and Parry responds with clarion confidence at the work’s conclusion. Yet, to the least and vilest things am thrall. Which is a proud and yet a wretched thing. Yet to the least and vilest things am thrall. ‘I know my soul hath power’ sets two stanzas from Nosce Teipsum, a didactic poem on human knowledge by Sir John Davies (1569–1626). 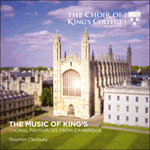 This is the simplest of the motets, almost entirely homophonic in style, but Parry makes it highly effective through his use of dramatic pauses and unexpected changes of chord and dynamics. O come quickly, sweetest Lord, and take my soul to rest! O come quickly, glorious Lord, and raise my sprite to Thee! Sir C Hubert H Parry (1848–1918) was one of the most important figures in late nineteenth-century English music. Parry’s role as a teacher and a writer was crucial; both he and Stanford were able to revitalize English music at a time when standards were low. Parry obtained his MusB degree whilst still at Eton, and before he went up to Exeter College, Oxford, one of his morning services had already been sung at Magdalen College. He was famous at school as a baritone and spent much of his time at Oxford playing sport. He found time to found the Oxford University Musical Club with C Harford Lloyd and studied privately with Sterndale Bennett and G A Macfarren. He also sampled the flavour of continental music, studying with the Englishman Henry Hugo Pierson in Stuttgart. After Oxford he worked for Lloyd’s Shipping, but continued his musical studies with Dannreuther who brought his work to the fore in 1880 when he played his Piano Concerto at the Crystal Palace. Parry was appointed to the staff of the Royal College of Music in 1883 when it opened, succeeding Grove as its director the following year. In 1900 he succeeded Stainer as Professor of Music at Oxford. Parry made many contributions to musical literature as a scholar (especially in his later years), including an important work on J S Bach. Although Parry played the organ as a youth and wrote some important pieces for the instrument, the life of the cathedral musician never attracted him. He did contribute much to the cathedral repertoire and his music was quickly absorbed into the repertoires of the choral foundations. Never weather-beaten sail is the third of the six so-called Songs of Farewell. It is a setting of words by Thomas Campion (1567–1620) and was published in 1916. It is written in five continuous parts, each of which has independence; the result is finely-crafted texture. In the third motet, ‘Never weather-beaten sail’, the number of parts is increased to five by the addition of a mezzo-soprano line. From here on, each motet in the cycle has one more voice than the one that precedes it, building eventually to eight parts. 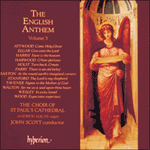 For the charming poem by Thomas Campion (1567–1620) Parry also eschews the dramatic style of the first two motets in favour of a much more flowing, essentially lyrical approach. Beyond the sphere of grief dear friends shall meet once more. Serene in changeless prime of body and soul. If not to waken so. Dear friends shall meet once more. Like Brahms (perhaps his strongest musical influence), Parry had a lifelong interest in matters metaphysical and philosophical, and an attraction towards the contemplation of mortality. This found fullest expression in his Songs of Farewell, a set of six unaccompanied choral pieces to texts by various authors. 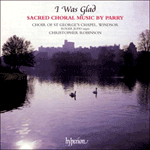 Parry began work on them around 1913 in the spirit of a personal testament; after much labour and reworking, he allowed a performance of five of the six by the Bach Choir in 1916, with which he was delighted. He never heard the complete set before his death in 1918; There is an old belief, No 4 of the six, was sung at his funeral. The author of its text, John Gibson Lockhart, was not a poet comparable with the others—who included Henry Vaughan and John Donne—set by Parry in this cycle; he is remembered today more as the first biographer of Sir Walter Scott. Yet his verses do articulate a more-or-less religious philosophy which was probably in line with that held by Parry and other leading spirits of the post-Darwinian age, and his line ‘That creed I fain would keep’ affords a good musical opportunity for quoting the Gregorian chant associated with the words ‘Credo in unum Deum’. Parry seems to write of belief in an after-life rather as did Thomas Hardy, ‘hoping it might be so’. Of body and of soul. For ‘There is an old belief’, Parry chose words by the Scottish poet, novelist and biographer John Gibson Lockhart (1794–1854) which declare that a better world lies ‘beyond the sphere of Time and Sin, and Fate’s control’. 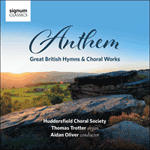 Serenity is the distinguishing characteristic of this motet, expressed by Parry in a sonorous six-part polyphonic texture, changing to a unison reference to the plainsong of the Credo where the text mentions ‘that creed I fain would keep’, and the motet ends with majestic choral writing. A prolific composer and writer, Sir Charles Hubert Hastings Parry (1848-1918) shares Stanford’s influential position in the late-nineteenth-century renaissance of British music. 'There is an old belief' is one of the six Songs of Farewell, a set of introspective pieces written towards the end of Parry’s life. The text by J G Lockhart expresses the desire for a place ‘beyond the sphere of Time and Sin’ where ‘dear friends shall meet once more’. 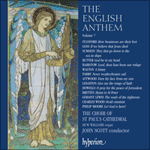 In the final section of the piece, Parry borrows a plainsong incipit used to introduce the Credo (‘I believe in one God’), subtly consolidating the themes of faith and hope. As if thou hadst sealed my pardon, with thy blood. 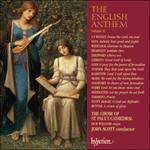 Anthem composers of the twentieth century and later have found particularly rich stimulus in English poetry, especially the works of the metaphysical poets of the seventeenth century. Parry’s At the round earth’s imagined corners sets one of the sonnets from John Donne’s Divine Meditations, published posthumously in the same year as Fletcher’s Miscellanies. It is the fifth of Parry’s six Songs of Farewell, composed in the last years of his life and published in 1918, the year of his death. The scoring expands from simple SATB in the first setting (My soul, there is a country, the best-known of the set) to SSAATTBB in the last (Lord, let me know mine end); the Donne setting is in seven parts, SSAATBB, which allows for wonderfully rich scoring of the unusually advanced chromatic harmony and counterpoint which these magnificent words drew from Parry. His final years were clouded by unhappiness and depression, brought on not least by his reaction to the First World War; while Donne’s sonnet is a vision of the Last Judgement, it is not difficult to imagine that the images of ‘scattered bodies’ and the closing idea of pardon purchased through the shedding of blood (the unexpected repeat of ‘as if Thou’dst sealed …‘, following what might have seemed the final cadence, brings the piece to a gently ambiguous harmonic close) might have carried much more immediate, human resonances for the composer. And to your scattered bodies go! The last two motets are the most ambitious: the fifth sets John Donne’s (1572–1631) ‘At the round earth’s imagined corners’, a vision of the Last Judgement. 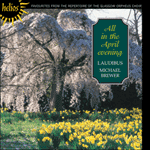 Parry’s contrapuntal gifts are displayed at their finest in the monumental seven-part writing that evokes the fanfares of the angelic trumpets, the rising from the grave of the ‘numberless infinities of souls’, and the distress of the sinner who has repented too late. and cannot tell who shall gather them. And now Lord, what is my hope! And make me not a rebuke to the foolish. Hold not Thy peace at my tears! as all my fathers were. before I go hence and be no more seen. Thou hast made my days as it were a span long: and mine age is as nothing in respect of thee; and verily every man living is altogether vanity. Deliver me from all mine offences: and make me not a rebuke to the foolish. Take thy plague away from me: I am even consumed by the means of thy heavy hand. Hear my prayer, O Lord, and with thine ears consider my calling: hold not thy peace at my tears. O spare me a little, that I may recover my strength: before I go hence, and be no more seen. Sir C Hubert H Parry (1848–1918) was one of the most important figures in late nineteenth-century English music. Parry’s role as a teacher and a writer was crucial; both he and Stanford were able to revitalize English music at a time when standards were low. 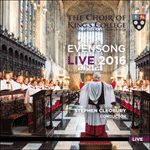 Parry obtained his Batchelor of Music degree whilst still at Eton, and, before he went up to Exeter College Oxford, one of his morning services had already been sung at Magdalen College. He earned fame at school as a baritone and spent much of his time at Oxford playing sport. He had time to found the Oxford University Musical Club with C Harford Lloyd and studied privately with Sterndale Bennett and G A Macfarren. He also sampled the flavour of Continental music, studying with the Englishman Henry Hugo Pierson in Stuttgart. After Oxford he worked for Lloyd’s Shipping, but continued his musical studies with Dannreuther, who brought his work to the fore in 1880 when he played his Piano Concerto at the Crystal Palace. Parry was appointed to the staff of the Royal College of Music in 1883 when it opened, succeeding Grove as its director the following year. In 1900 he succeeded Stainer as professor of music at Oxford. Parry made many contributions to musical literature as a scholar (especially in his later years), including his important work on Bach. Although Parry played the organ as a youth and wrote some important pieces for the instrument, the life of the cathedral musician never attracted him. He composed much church music which was quickly absorbed into the repertoires of the choral foundations. The motet for double choir Lord, let me know mine end is the last in the set of six pieces that form the Songs of Farewell. These motets were written between 1916 and 1918, towards the end of Parry’s life, and are among his most deeply felt works. 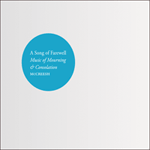 The first five anthems in this collection are settings of words by the metaphysical poets, whereas the last sets a biblical text and contains ‘passages of rare beauty and imaginative insight’. It is fitting that this work should be chosen to represent the music of Parry; the final words are ‘before I go hence, and be no more seen’ and the composer is buried in the crypt of St Paul’s. He heapeth up riches and cannot tell who shall gather them. And now, Lord, what is my hope? Ev’ry man therefore is but vanity. And be no more seen. 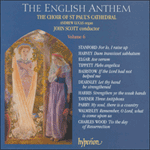 The climax of the entire cycle, and the longest of the motets, is ‘Lord, let me know mine end’, a setting of verses from Psalm 39 for double choir. The two four-part (SATB) groups allowed Parry to compose antiphonal responses as well as very full eight-part harmony and very elaborate eight-part polyphony, in addition to giving him a tremendously varied vocal palette from the leanest to the fullest textures. He took advantage of all these possibilities in a work that is a tour de force of a cappella technique. The final section, ‘O spare me a little’, has a wonderful luminous delicacy and poignancy that suggests that the composer, who by now was suffering from a serious heart condition, may have known he had less than three years to live. And verily, ev’ry man living is altogether vanity.